I apologize that this post is SO late this month! Did anyone else receive their Ipsy really late like I did? Anyway... this month has some unique items... let's get right to it! Pacifica Natural Waterproof Eye Pencil - The color is not listed on this, but mine appears to be a dark brown shade. Just from testing it on my hand, this liner feels really soft and smooth. I don't typically like pencil liners, but I just might have to give this one a try. Briogeo Don't Despair, Repair! Deep Conditioning Mask - This has a subtle fresh scent, and there looks to be enough in here for one mask if you have long hair. You know I love my deep conditioners, so I'm anxious to try this out. LeeAnni Eco 3-in-1 Revolution Light - You wouldn't gather what this is from the name, but it's a toner, serum and moisturizer in one. It doesn't really smell like much and the ingredients appear to be mostly, if not all, natural. Hikari Lipstick in Cabernet - This color is a brick red and honestly, it's not very smooth on the lips. I've never heard of this brand, but judging from this one lipstick... I can't say I'm impressed. Crown Brush Infinity Shadow & Crease Duet Brush - I really like all the brushes I have from Crown Brush. I think they're a great affordable alternative to Sigma or MAC, and this brush is no different. It's soft and dense and works great! 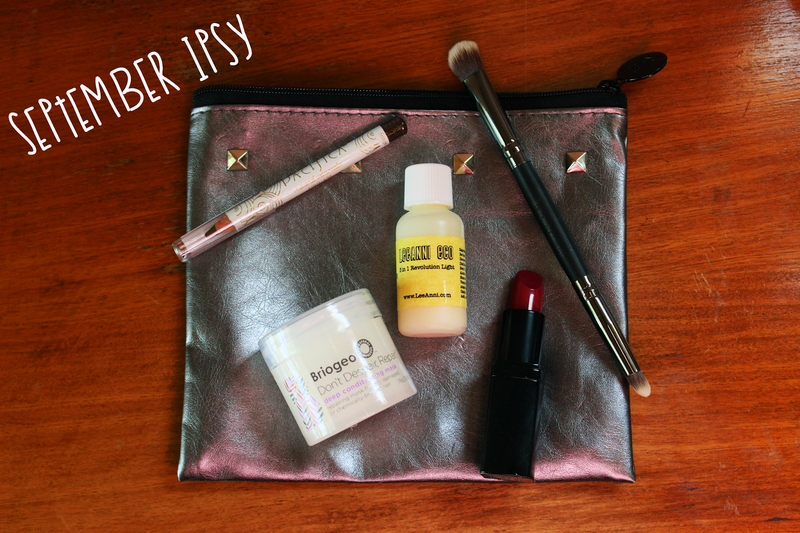 Ipsy costs just $10 per month and you get some really great items each month. If you want to sign up, just click here. I can promise you that you won't regret it!